This is a Hindu mythological story about an unfortunate boy whose name was Shravan Kumar. He is a character in the Hindu epic Ramayana who had great devotion towards his blind, old and frail parents who were actually hermits. Long ago there lived a boy named Shravan Kumar. He was an unlucky child as his parents were blind and Shravan Kumar had to do all the household work in addition to looking after / taking care of his blind parents. He was a very responsible and dutiful son. He used to willingly fulfill all the wishes of his parents with dedication. As his parents grew older, once they expressed their desire to go on a pilgrimage. In the olden days people (Hindus) used to go on pilgrimage in their old age to get purified of their sins. Shravan brought two big bowl-shaped baskets and placed each of his parent in each basket. He then tied the baskets to a big bamboo stick and made a balance like device. He then placed each of his parent in each basket and tied the baskets to a bamboo stick and thus made a balance like device to carry his parents. He set for pilgrimage carrying his parents on his shoulders. On the way Shravan Kumar offered fruits to his parents. After walking for a long distance his parents felt thirsty. 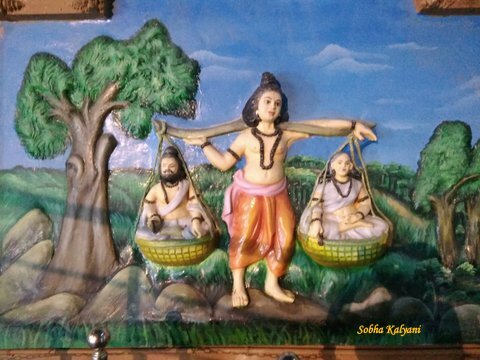 They reached a forest near Ayodhya and Shravan Kumar placed the baskets with his parents under a tree and went to fetch water from River Sarayu. 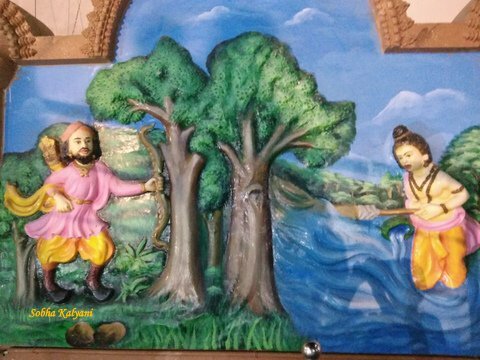 Dasarath (King of Ayodhya and father of Lord Rama) who, at that time, was the crown prince of Ayodhya was wandering in the forest hunting animals. In those days hunting wild animals was a royal time pass activity. Dasarath had a special ability of shooting arrows at an animal just by hearing the sound made by the animal without spotting it. While Prince Dasarath was busy hunting animals, at the same time Shravan Kumar who came to fetch water from river Sarayu, dipped the empty earthen pot into the river to fill it with water which produced a typical sound. Prince Dasarath who was hunting animals, heard the sound, mistook it to be an animal and shot an arrow in the direction from where the sound was being produced. The arrow swiftly moved in the air and straight away pierced into Shravan Kumar's chest who yelled in pain. On hearing the cry of a human voice, Prince Dasarath rushed to the spot and was shocked to see an innocent young hermit boy crying in pain. Prince Dasarath was very upset at the sight and neared the boy. On seeing the prince, Shravan Kumar told him that he came to the river to fetch water for his thirsty blind parents who are eagerly waiting for him to get the water. He requested Dasarath to pull out the arrow from his chest and relieve him from pain, take water for his parents and then inform them about the death of their son. As instructed prince Dasarath pulled out the arrow from Shravan Kumar's chest and then carried pot full of water to his blind old parents who were waiting for their dear son. When Dasarath offered water to them, the blind parents could sense that it was not their son and refused to drink water. They asked him who he is and what happened to their son. Dasarath revealed his identity and narrated all that had happened. The blind hermit parents couldn't control themselves on hearing the plight of their son and ordered Dasarath to carry them to the place where their son was lying. Dasarath carried them to the spot where Shravan Kumar was lying. On seeing his parents, Shravan Kumar said that he would be waiting for them in the heaven and would resume his services to them when they reach heaven. After uttering those last words to his parents, Shravan Kumar fell down at the feet of his parents and breathed his last. The poor grief-stricken parents couldn't tolerate the separation and cursed Dasarath for killing their innocent son. They cursed that he too would meet his death in a similar situation. After cursing the prince, the hermit couple fell down dead in pain. Later, their curse worked when King Dasarath grieved and died in pain for getting separated from his dear son Rama who was sent to forest on 14 years of exile. This age-old story teaches a lesson that a person would suffer for the sins he / she committed in the same birth itself and not in his / her next birth. So the lesser the sins committed, the happier the life would be.